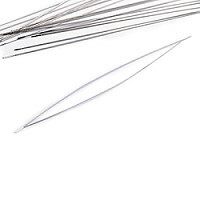 The Thin dropping needle has a threaded eye along its length, which makes it easy to thread. You will also use them for seed beads. They are loose in a bag. They have a flat shape.